Hearing Men’s Voices (HMV) is a program that engages men in Jewish life by building male relationships and extending Jewish community. Hearing Men&apos;s Voices facilitates intimacy among men through dialogue. Men meet in groups to discuss common issues. The quality of dialogue can be rich and enjoyable. Jewish men face unique challenges. Women have made dramatic progress in the workplace, the synagogue, the community and the home. Notably, women have utilized female support groups to improve their role in society. Jewish men are ready for greater male intimacy, and they are looking for male forums. Men’s Clubs are the natural venue for Jewish men to engage in quality conversations. The FJMC has prepared wonderful materials to facilitate the creation and management of Hearing Men’s Voices groups. Below are overviews of some of the materials. Visit the FJMC Store to order the materials you need for your club. This volume explores the often-complex relationship between a man and his father, from both sides. Some programs refer to our relationships with our fathers, while others examine our relationships with our sons. In all, the 8 programs in this series allow men to examine some of the issues involved in these relationships, in a non-threatening, Jewish environment. As men, we have grown up to feel that it is our role to be strong and virile. Unfortunately, life doesn’t always work out that way, certainly not on a permanent basis. We age, we get sick, we lose our hair, we allow ourselves to get out of the physical condition that we used to pride ourselves in. The 15 programs in this series allow a Men’s Club/Brotherhood to address the health care concerns of its members, and to provide a real service to all members of their communities. Most of us had Jewish training in our youth, culminating in the ritual of Bar Mitzvah. For many of us, unfortunately, we have not given too much thought to God and the role of religion in our lives most of the time since then. We are too busy with the other aspects of being an adult male to think of our spirituality, and the role that God could play in our daily lives. This series of 13 programs allows men to explore ways that God does have a role in our lives, and how we can enhance our quality of life by increasing the role of spirituality in it. Groundbreaking essays on the significance of work in menís lives. Includes structured program ideas to explore work-related topics in your community. Covers everything from security issues to workplace ethics, illness, and the loss of a job. Contributors range from doctors and lawyers to rabbis and cabinetmakers. Program 1: Self Definitions -Are we defined by our work? -Rabbi Kerry Olitzky, Executive Director of the Jewish Outreach Institute and author of many books that bring Jewish wisdom into everyday life, including, most recently, as coeditor of Jewish Men Pray (Jewish Lights Publishing). How do we explain the disappearance of men from the Jewish community? Why do so many of today’s Jewish men find their experience in the synagogue unfulfilling? Indeed why do they stay? 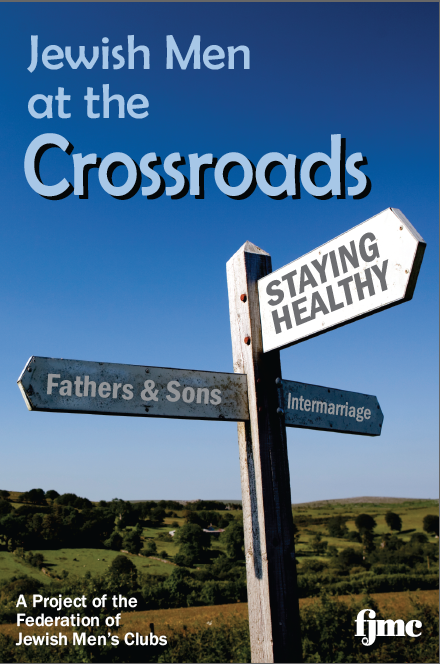 Jewish Men at the Crossroads addresses these and other questions facing modern Jewish men — everything from intermarriage to co-parenting, sexual dysfunction to retirement, the role of men in a post-feminist world to the role of God in men’s lives. Jewish Men at the Crossroads is essential reading for today’s Jewish man.